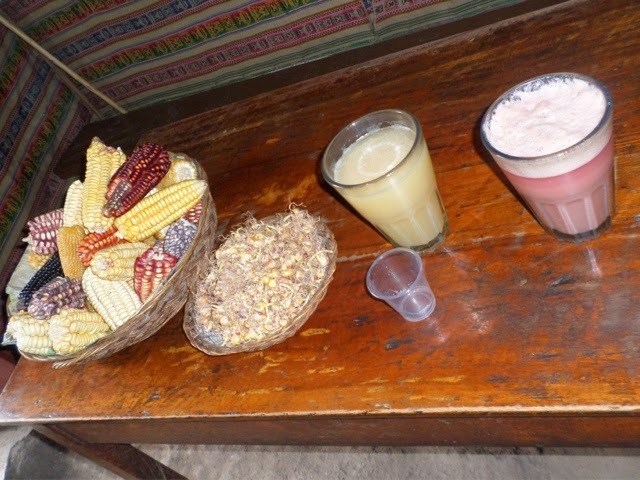 We did a day tour of the Sacred Valley, the most important agricultural area in Peru. 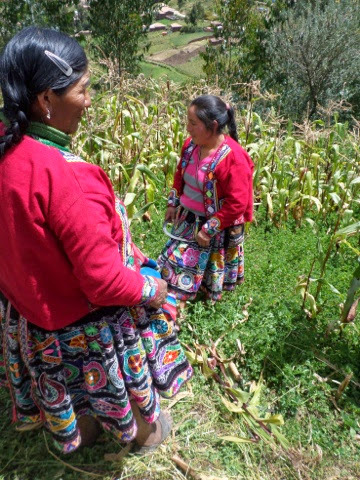 They mainly grow maize and quinoa. It was interesting to learn that the outer husk of the quinoa grains actually toxic. Therefore it’s quite difficult to get an edible product from quinoa as the grains are so small. Peru is the largest quinoa producer and they usually use it in porridge or soups. View across the sacred valley. 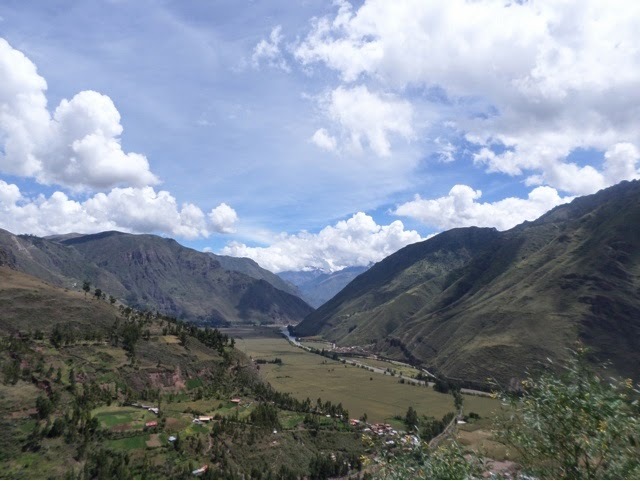 The river which flows along the Sacred Valley used to be known as the Sacred River, but is now known as the Rio Urubamba. There is a glaciated mountain called Urubamba nearby and which is the source of the water and therefore the name comes from this too. The river and the valley are considered scared for a few reasons. The path of the river was originally said to follow the same path as the Milky Way and the local people believed that the Milky Way contained the same things as the valley. Also the river was considered to follow the same shape as lightening, which is considered to be the connection and message source between the gods and the earth Pacha Mama. Nowadays a 3km stretch of the river has been channelized. We passed through a local town called Pisaq, this is located in the centre of the Sacred Valley and we stopped off for some amazing empanadas, yummo! 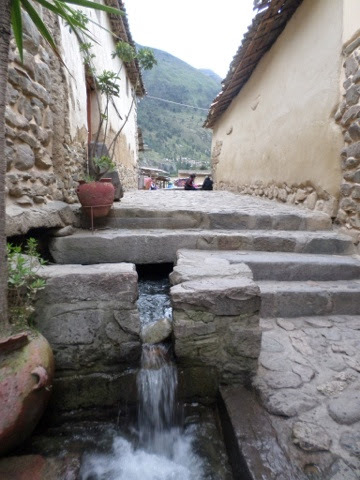 Pisaq town was originally an Andean town, located up on the tops of the hills above the terraces. You can still see evidence of the old buildings which were houses and ceremonial buildings. When the Spanish arrived in the sixteenth century they forced the Quechan people to move into centralised towns in the valley as this made administration and taxation easier to manage. However, there had been a very good reason for the people to live up on the hillsides – flooding. In 2010 the town was hit by a very bad flood, killing many people. The towns bridge was also washed away and as a result Machu Picchu was cut off for around five days and people had to be rescued by helicopter! It seems a recurring theme around the world that indigenous people live in harmony with their habitats and then invaders who think they know better impose western ways of life on them, which are actually worse. We then headed over to a community project which is supported by Intrepid. Here we were dressed up by two wonderful local women. Everyone looked amazing, especially the girls in the beautiful embroidered skirts. The men got to wear ponchos and silly hats. The girls all got circular hats with draped fabric, some embroidered. They are quite hard to keep on your head though! We then harvested corn, took it back to the village and shucked it. It was good fun, but obviously a bit of a novelty. Back in the village we had an amazing dinner, cooked by a chef resplendent in his full chefs whites – awesome. The local women were all spinning and making local crafts too, which they sell locally, as you see everywhere else too. The terraces in the area go almost the full height of the hillsides, it’s very impressive. It was also interesting to learn the full extent that geology and geography dictate people’s lives. The terraces are most usually on the eastern side of the hillsides. This is so they catch most of the sun. In this area the mountains are mainly pink granite and e terraces are also built up out of the pink granite, although there are some limestone areas also nearby. The high quartz content of the granite means that it holds the heat of the sun and radiates it back throughout the night and essentially creates a microclimate which protects the higher altitude crops from frost damage. 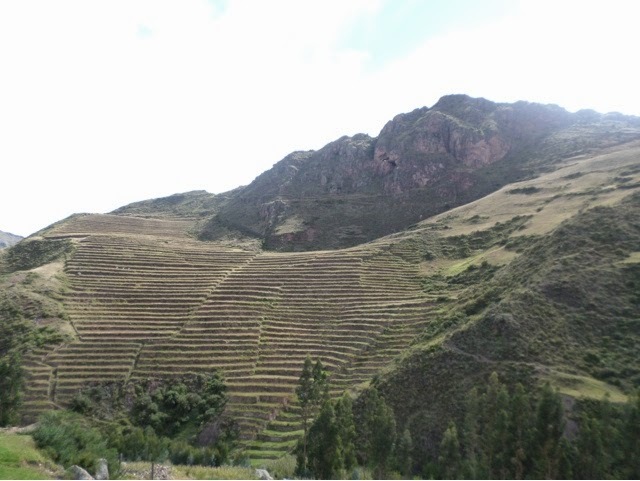 The different terraces are used to allow growth of differing crops which are best located at differing levels. Crops such as maize will only grow lower down in the valley and most of the valley floor is covered with maize fields. Potatoes, quinoa and kiwichi can actually be grown to an elevation of 4000m! They also operated a system of crop rotation and allowed recovery through fallow years. During fallow times they used to cultivate legumes to enrich the soil. They also grow lupins in fallow fields, which are actually eaten here. I was also interested to learn that they grow a lot of alfalfa here too, but it is only considered as a food for livestock! 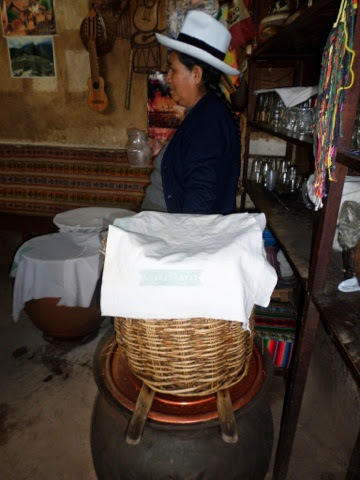 We visited a centre in the town of Urubamba where a local women explained how she makes the traditional fermented drink Chi Cha. Chi Cha is drunk by everybody including children and ranges from non-alcoholic to very strong depending on the number of days fermentation. They also have yellow and red Chi Cha. The yellow is slightly fizzy and is almost like slightly off pale ale. The red is more palatable and is sweeter and fruitier. To start with you need a lot of maize. 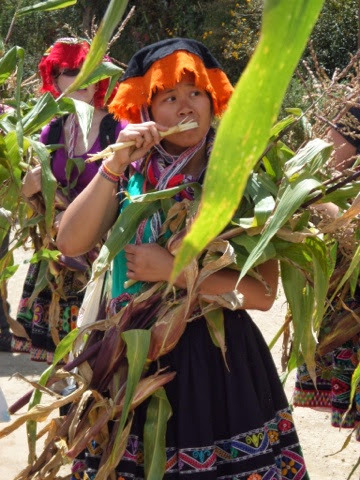 The maize cornels are soaked for 1 day and then they are buried, covered over by the leaves of the corn plants. They are left this way for between 2 days and 10 days depending on the climate at the time. At the end of this the cornels have germinated. The germinated cornels are then boiled in water for a day, sometimes for longer, in large pots. After this the liquid is strained through a wicker basket lined with straw. The liquid is collected in a bucket underneath and it’s quite a slow process. The end protect is the. The leftover cornel pieces in the strainer are used as feed for guinea pigs. The woman had a huge room of guinea pigs next door and they all looked very fat and well fed :-). After the demonstration we played a local game called Frog. The game consists of throwing metal coins at a cabinet which has different slots cut into it and also a metal frog attached on the top. The aim is the get the coins into the frogs mouth. 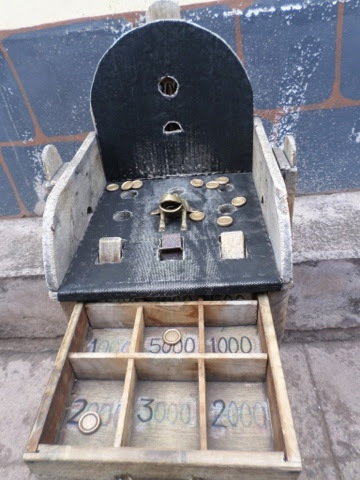 The coins fall into a drawer below and at the end you count up the number of points you have. Holger was very impressive and managed to get the frog! He really seems to have come to life since we came to the highlands and seems extremely happy and lively since Cuzco , obviously back in his natural environment of the highlands :-). It was then time to head to the town of Ollantaytambo, which is the launching point for most people hiking trails to Machu Picchu. A river runs through the town and there is a system of aqueducts built along the streets which are very picturesque. There are also more terraces and ruined buildings on the hillside, which are grain stores, cool in their elevated positions. 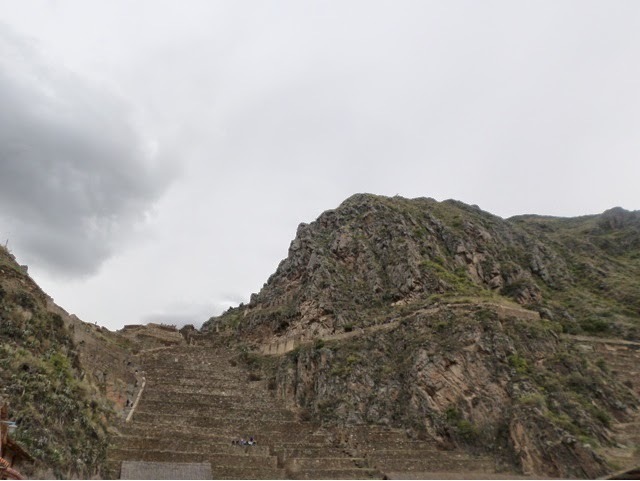 The name of the town Ollantaytambo is actually a Quechan name and is two words together. Apparently Quechan has no grammatical form and you can just mash things together to create your meaning. 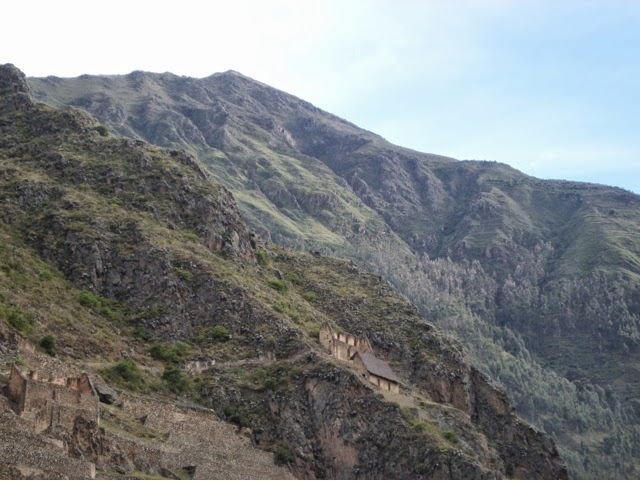 Ollantaytambo is actually Ollantay Tembo, Ollantay is the name of a historical warrior and Tembo means resting place. According to legend the warrior fell in love with the daughter of the king, who disapproved of the relationship and the warrior was banished/had to escape to the town. He lived there until the king died, was replaced by a new king and was allowed to return to Cuzco to marry the woman… Although it either must have all happened fairly quickly or it was a miracle a young single princess wasn’t married off in the meantime… It’s a good story though. 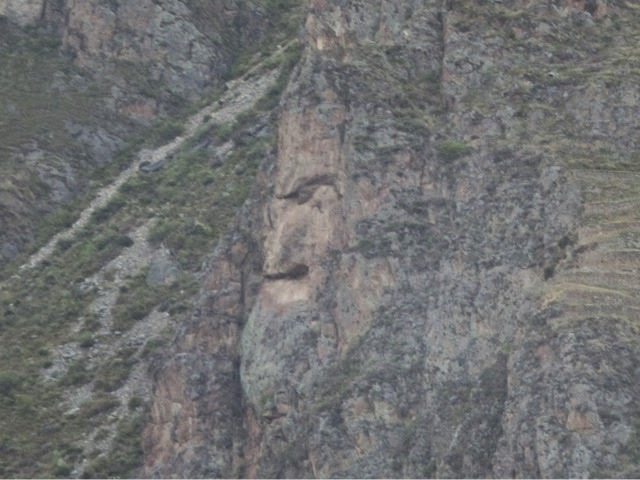 They also think there is a face in the cliff side… Quite eerie! Apparently he is the father looking over everyone. Tomorrow we all set off on our respective trails. Most of the group are hiking the traditional Inca Trail. Four people are returning to Cuzco for more sightseeing and meeting us in Machu Picchu. I am hiking the alternate Quarry Trail, with another four people I have yet to meet. Unfortunately as I had to get a new passport I missed out on a permit for the traditional Inca Trail. However, I am not really bothered by this as the Quarry Trails looks incredible and is less walking, which will be probably be better for me as I have been struggling with my breathing ever so slightly up here. I am also starting to take Diamox again tonight as a preventative measure, but am hoping that this time I don’t lose all the feeling in my hands and feet! 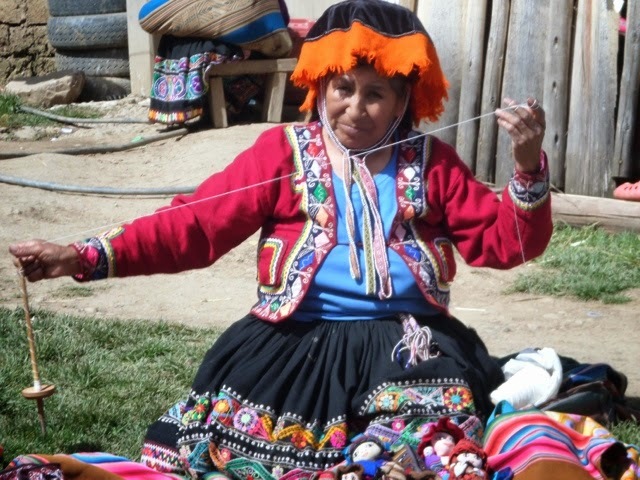 This entry was posted in Travel and tagged Chi Cha, Empanadas, Flood, Frog Game, homestay, Intrepid, Maize, Ollantaytambo, Pacha Mama, Pisaq, Quechua, Quinoa, Rio Urubamba, Sacred Valley, South America, SouthAmericanAdventure, Sugar Cane, Terrace, Travel. Bookmark the permalink.